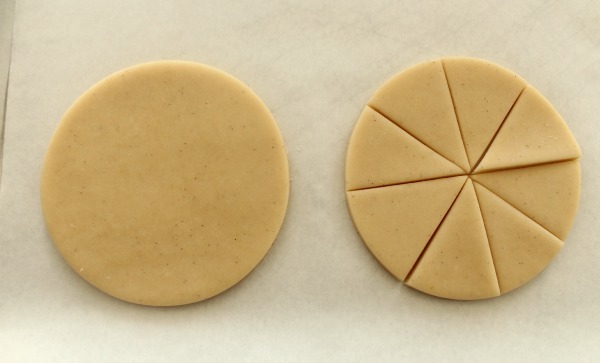 To make mini-pie slices use a knife to cut simple circles into wedges. 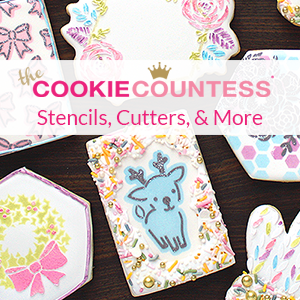 The size of the cookies will depend on what size cutter you use. 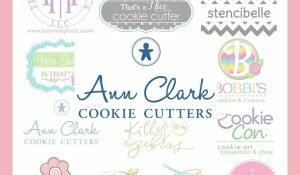 When it comes to circle cutters I love graduated sets because I always have the size I need. 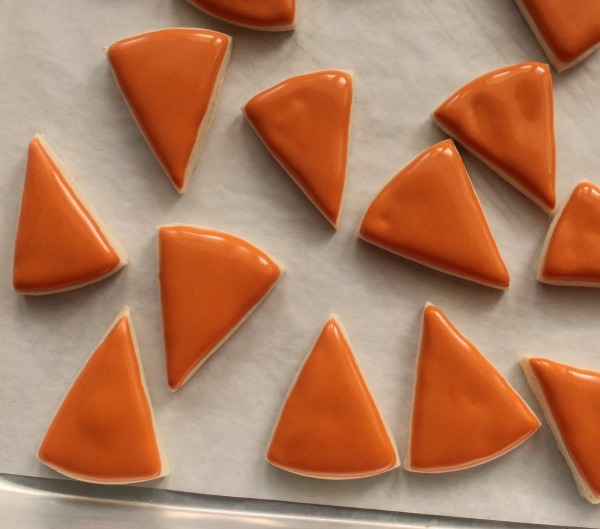 If you have a mini-candy corn cutter, that would work too. 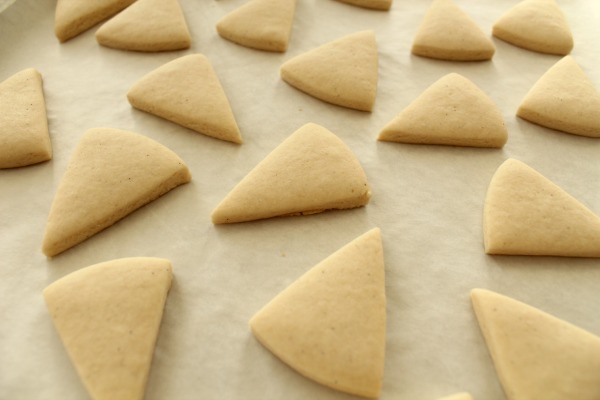 To make the crust, position a #101 tip near the left corner of the cookie, thin side up. Slowly move up and down in a loose “M” shape until you reach the opposite side. Use a boo-boo stick or toothpick to clean up any sharp points if necessary. If you’re new to petal tips, don’t let them intimidate you. Practice on a paper towel until you feel confident. 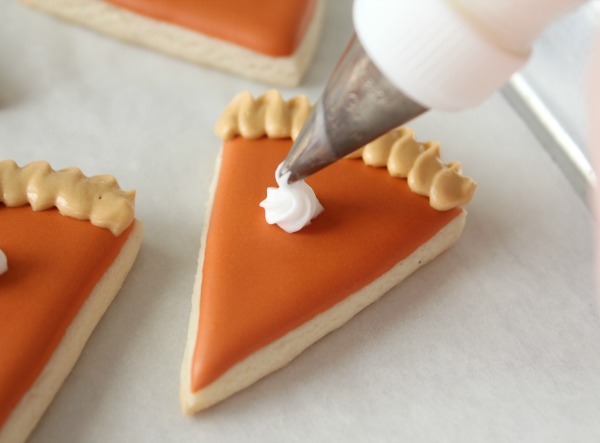 Finish up by using a star tip to add a dollop of whipped cream. I used a #16, but an #18 would work well too. 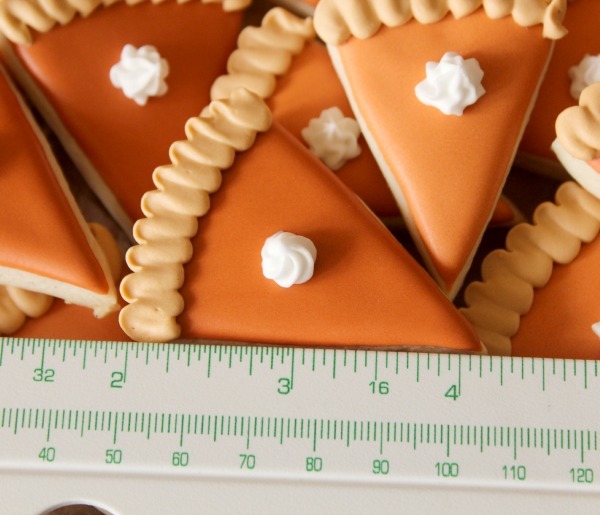 Including the crust my mini pie cookies were just a little over two inches long. For tips on making a larger version, click HERE. Use these cuties to fill Mason jars for an adorable gift. 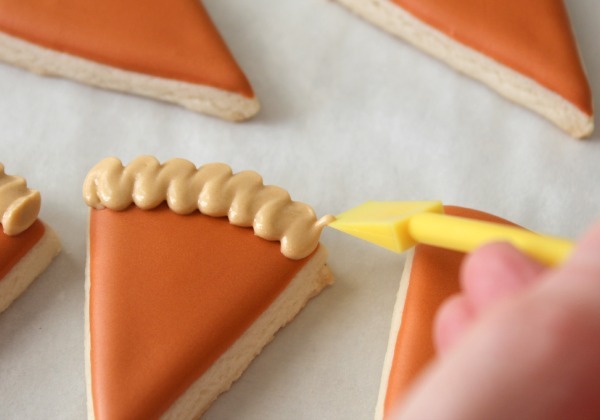 cute but i don’t see what the cookie is – pie crust, sugar cookie? VERY cute!!! Thanks for the instructions, gonna get on these right now! Are you sure you want to put these in a mason jar for a gift? I think they’d get pretty messed up . They will be fine- after 24 hrs the royal icing is very durable! 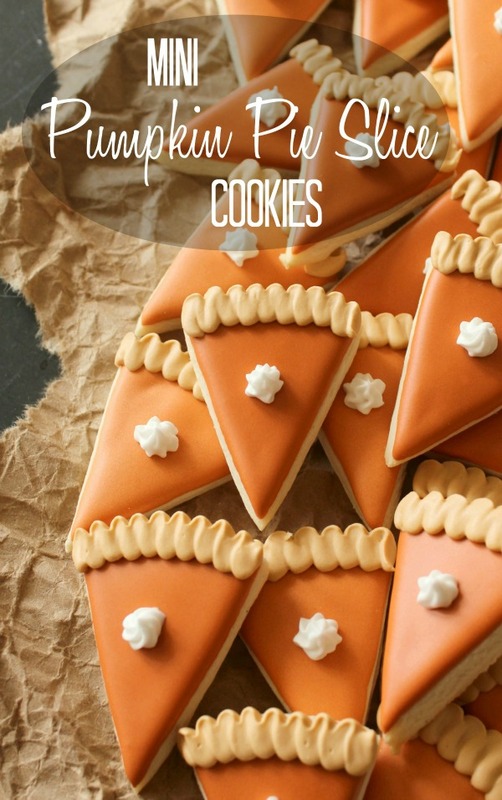 These are adorable, but I’m pretty annoyed that the recipe isn’t posted. If you are going to post these things, you should post the recipe. This is just a tease. All of the recipes are under the recipes tab at the top of the page. 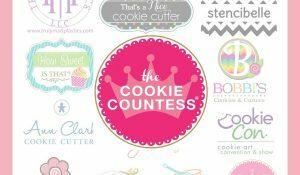 A couple things: what sugar cookie recipe did you use? I’m worried that mine might puff up while baking. Also, 20 second icing? These are adorable! The icing is absolutely top notch too. 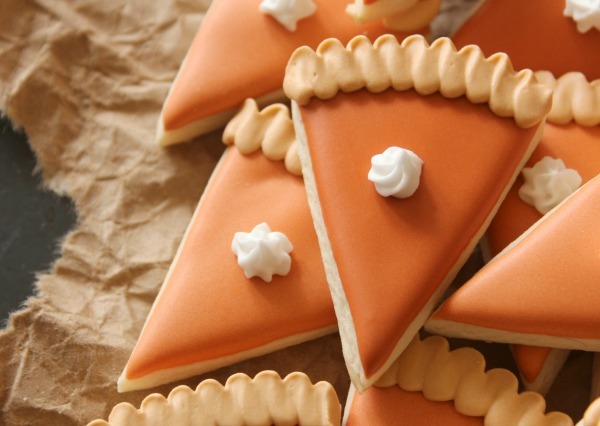 I just finished making the pumpkin pie slice cookies! I loved all of your instructions! I ordered all the coloring you suggested, plus more and I ordered the pumpkin emulsion. They turned out awesome, I’m so proud of myself! hehe At first, I was overwhelmed with tackling this because I’ve only made RI maybe 3 times and decorated very little. I am definitely a beginner. With your RI recipe and tips, cookie recipe, and instructions, I DID IT! 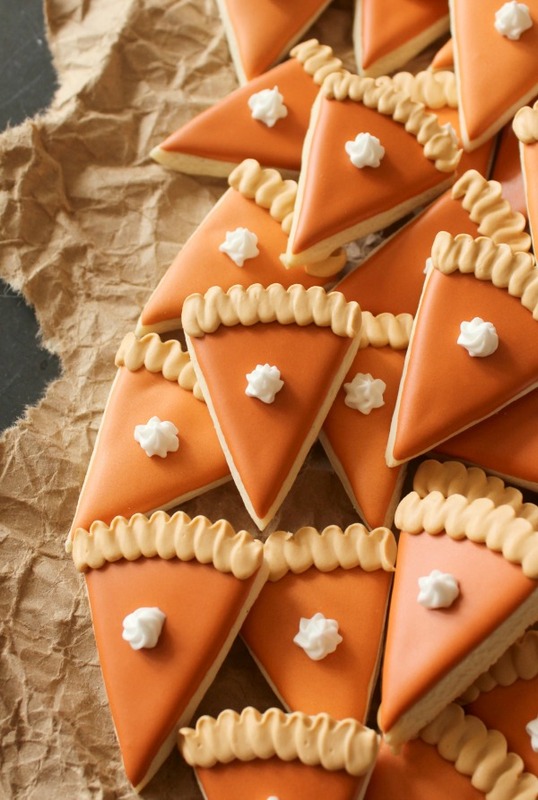 Now that it is the day after Christmas, whose going to eat all of these?!! Thank you and I plan on visiting you more! This cookie recipe has great taste. I can tell this recipe is going to rock. How does the whipped cream not get squished or just slide off? 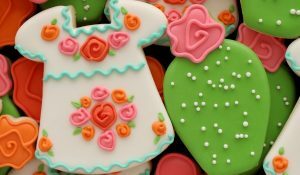 The “whipped cream” is actually white Royal Icing- made the consistency of toothpaste. Once dried overnight, it is hard :). Subscribe here to get updated about every post. 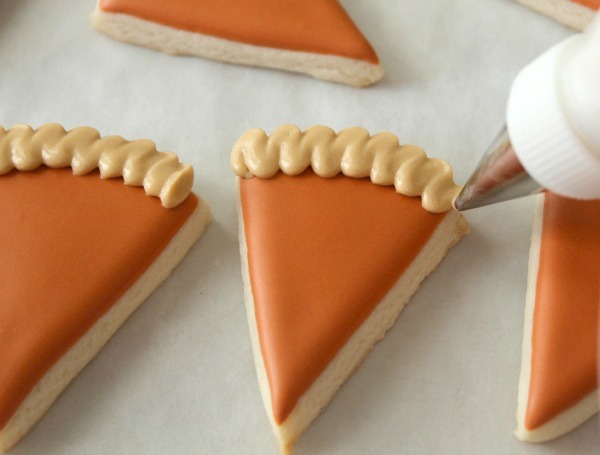 How do you make the crust and what do you need to make them? 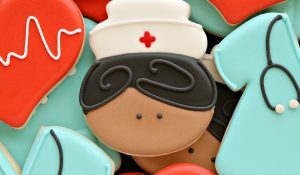 Hi, im newbie to icing cookies. Can you tell me how long in advance can i make these and how long can they be stored? In fridge or room temperature? Thank you!! !